Locate the Files icon and click it. 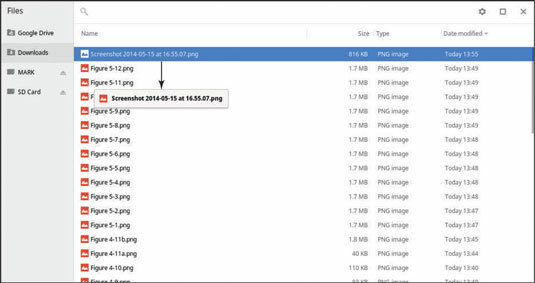 Files opens in a window that is not a Chrome browser. When using the touchpad, after clicking and holding the file, use another finger to drag the file to the desired folder. Hovering the file over the folder highlights the folder. Release to drop the file into the target folder. From within the Files application window hold the Ctrl key and click the desired files. The files you click are all highlighted. Click and hold on any part of your selection; without releasing, drag the selection to the desired location. Hovering the files over the destination folder highlights the folder. Release to drop the files into the target folder. Hold down the Shift key, then click with one finger or thumb and move the pointer with another finger to highlight several consecutive files at once. Click any part of your selection; without releasing, drag the selection to the desired location. Holding the files over the destination folder will highlight the folder indicating it is okay to release your finger from the touchpad.